Last week, I decided it was time to embrace fall. The weather is cooler, the girls have had their seasonal colds, the leaves are changing....GAME ON! So I attempted a little fall decorating. I haven't done much decorating the past few years but as the girls get older it just seemed more appealing this year. 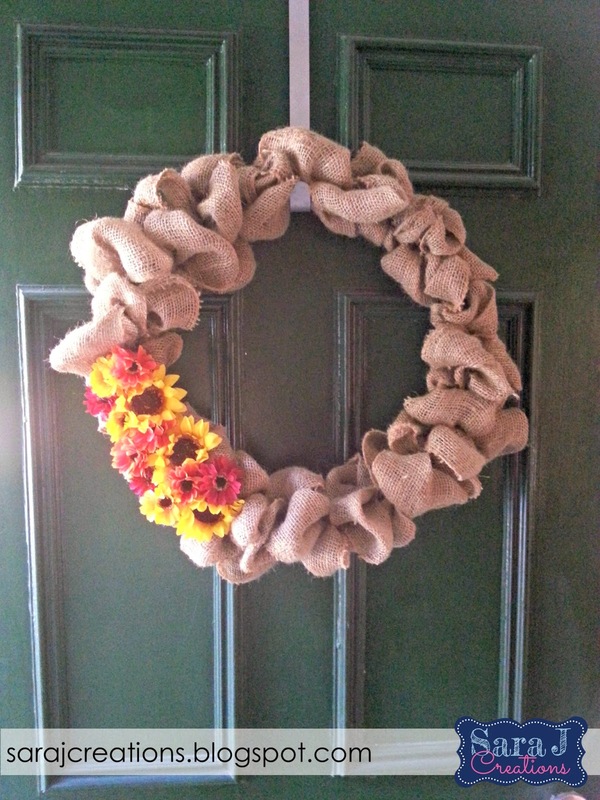 After seeing all the burlap wreaths on Pinterest, I decided I could do that. So I did. It was a little harder to get started than I thought. I was weaving it in and out of the metal frame. It didn't look right and I could see the metal frame still. I kept going even though it didn't seem right. I checked a few different tutorials online and decided to keep going with the weaving technique. It started looking better as a fluffed up the bubbles but then I started to worry that I was going to run out of burlap, as I only bought one spool of it. I ended up having enough and when I went back and fluffed up the burlap, it looked MUCH better. The fall flowers are just hot glued on. Easy and probably quick if you don't try making it while keeping a 2 year old and a baby entertained at the same time. Next, I decided it was time to update our mantle. I made the banner on my Silhouette Cameo. I used kraft cardstock for the pennant shape. I used Silhouette Double Sided Adhesive for the letters in autumn. This was my second attempt at this product. It was tricky but I think that was because of how thin the letters were that I was using. I peeled all the letters out, stuck them to the pennants and then sprinkled with the Silhouette green glitter. Their glitter is perfect for this type of project - it is very fine and comes in great colors. I strung the banner with baker's twine. The leaf part was one of the free shapes from Silhouette. The subway art was something I made a few years ago and just pulled out for the occasion. The shiny pumpkins are from Target. The vases are IKEA that my sister spray painted white and wrapped with twine. The J is an old Reader's Digest cut into a J. How cool is that?? We found it on Mackinac Island at a paper store called Poppins. The pictures were already on the mantle in different sized black frames. 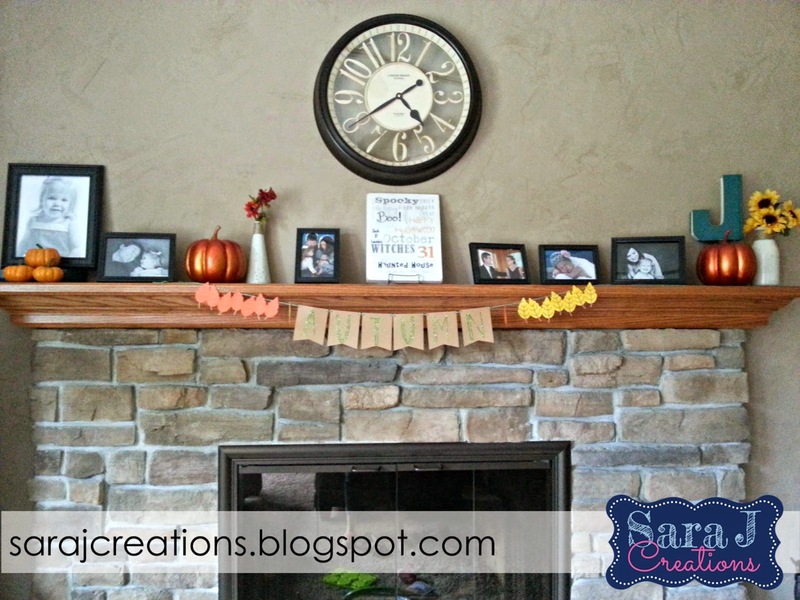 I just took a few away to make way for the other fall decor. Then I decided to pull out my fall books from my classroom stuff in the basement. I wanted to keep them separated as much as possible from the girls' other books. I found one of many plastic bins that was in my classroom but that wasn't enough. I needed some a label. Not that my girls can read yet but the organizer in me just wanted a label on it! 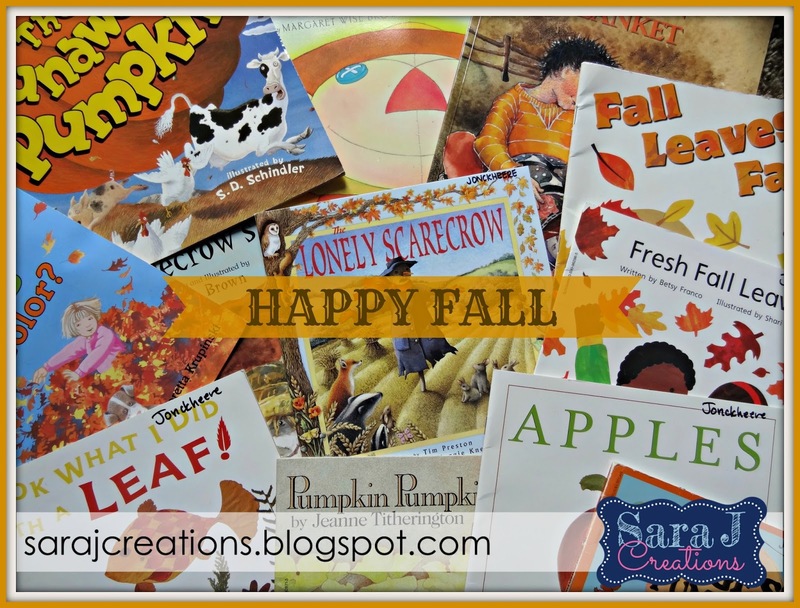 While I was creating the label I figured I should make them for all the other seasons and holidays that I have books for. My plan is to switch the label and the books and use the same bin. Click HERE to download these seasonal and holiday labels for FREE! !